Akki Rotti (or flattened rice flour bread) is a staple of Karnataka – eaten as a breakfast, after school snack or even a lunch box item. Other similar flatbreads native to Karnataka are Ragi Rotti (made with finger millet) and Jolada Rotti (sorgum flour). The variations to this akki rotti are endless – in season, we add field beans (avarekaalu), mom even adds grated capsicum for that extra punch, and today I added grated cabbage and carrot to sneak in veggies for those picky days for kiddo. As its already loaded with masala (spice) and veggies, theres really no need of an accompaniment and actually tastes good even when eaten with just jaggery and ghee. 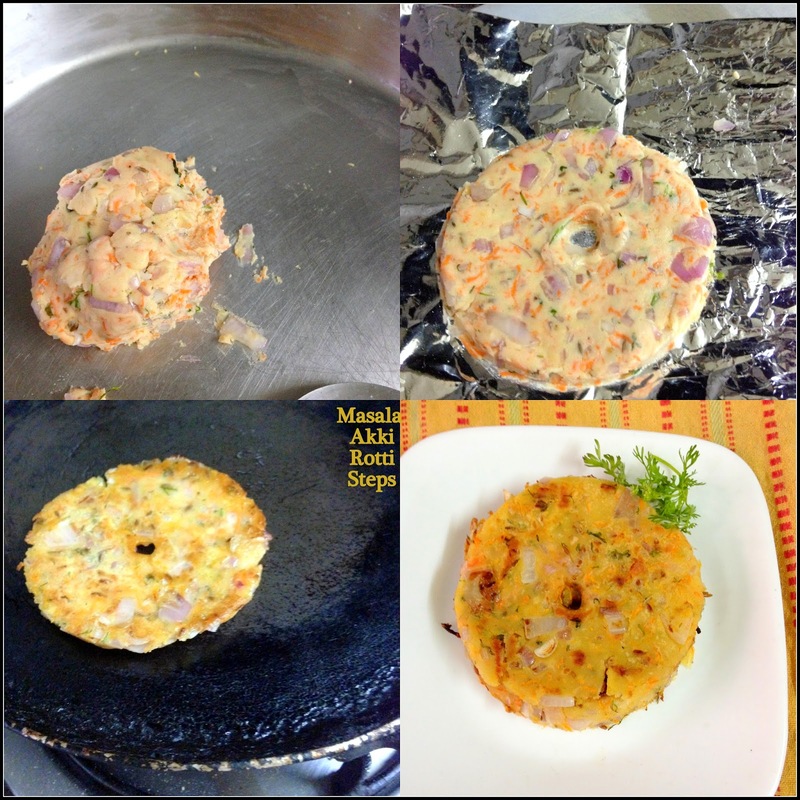 Today’s post for School Lunchbox is Masala Akki Rotti. You may even prepare the dough the night before to help you make this quickly for rushed mornings. If you are lucky to have this piping hot , just off the griddle, don’t count how many you eat (I didn’t). After a couple, you actually feel full and may even skip lunch. After Grilled Potato Sandwich yesterday, this akki rotti is on its way for Day 2 of School Lunchbox recipes on BM#41. Also linking to Jayanti who is hosting Valli's Kids Delight event. P.S : Veggies and masala powders are totally optional and can be varied according to your preferences. Avoid green chillies and ginger if preparing for younger kids. One of my friends in Bangalore even adds a tsp of grated cheese while making it for her toddler daughter. In a large mixing bowl, add 4 -5 TBSP of warm water, onions, jaggery, cumin and asafoetida and leave for 5-8 mins. Add this masala paste, salt to the jaggery-cumin water in the bowl. Mix well, add flour little by little and make a smooth dough (the water in the masala paste provides adequate moisture). Add little warm water if required. Grease a plaintain leaf or a Ziploc cover. Make equal roundels of the dough as you would, for chapatti. Pat one roundel with oiled fingers on to the Ziploc / plaintain leaf. Make a small hole (as shown) in the middle for even cooking. On a medium-low flame, add 1 tsp of oil around and in the central hole. After 4-5 mins, flip over and add oil if required. Once brown spots appear, cool to pack in a lunchbox. Looks so delicious kalyani...wish my kids eat this! They turned out lovely. What a treat! Ohh what a great recipe! Looks too good..
Am craving for some akki rotti and u tempting me here, they came out simply fabulous Kalyani. Wow it looks amazing. .its dinner time and I would love to swap my platter with this one. Perfectly made akki rotti. Very colorful. Looks so tempting! I am bookmarking this recipe. Very colorful and yummy akki rotti.